Today(Sunday, October 7th, 2012) the Search Engine Google is showing below Doodle on its Home Page for honoring the famous scientists Niels Bohr on his 127th Birth Day anniversary. And, also it shows release of electromagnetic wave while electron jump from outer orbit (n=3) to inner orbit (n=2). And it shows the relation between the energy difference and the frequency of the emitted wave as δE=hv. v- frequency of the released wave. Niels Henrik David Bohr was born on October 7, 1885, in Denmark as the son of Christian Bohr, Professor of Physiology at Copenhagen University, and Ellen, née Adler. Niels Bohr received the Nobel Prize in Physics in 1922 for his foundational contributions to understanding atomic structure and quantum mechanics. Niels Bohr mentored and collaborated with many of the top physicists of the century at his institute in Copenhagen. 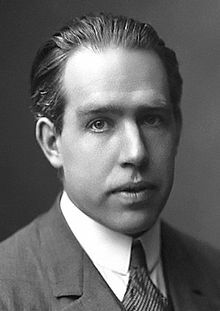 Niels Bohr married Margrethe Nørlund in 1912, and one of their sons, Aage Bohr also received the Nobel Prize in 1975. Niels Bohr has been described as one of the most influential scientists of the 20th century. Niels Bohr was a passionate footballer too. Niels Bohr was one of the founding fathers of CERN (European Organization for Nuclear Research) in 1954. Niels Bohr Received the first ever Atoms for Peace Award in 1957. In 1965, three years after Bohr's death, the Institute of Physics at the University of Copenhagen changed its name to the Niels Bohr Institute. The Bohr models semicentennial was commemorated in Denmark on 21 November 1963 with a postage stamp depicting Bohr, the hydrogen atom and the formula for the difference of any two hydrogen energy levels. Bohrium (a chemical element, atomic number 107) is named in honour of Bohr. Hafnium, another chemical element, whose properties were predicted by Bohr, was named by him after Hafnia, Copenhagen's Latin name. Asteroid 3948 Bohr is named after him. The Centennial of Bohr's birth was commemorated in Denmark on 3 October 1985 with a postage stamp depicting Bohr with his wife Margrethe. In 1997 the Danish National Bank started circulating the 500-krone banknote with the portrait of Bohr smoking a pipe. 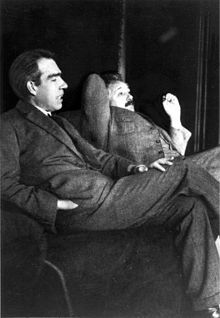 The Bohr–Einstein debates were a series of public disputes about quantum mechanics between Albert Einstein and Niels Bohr, who were two of its founders. Their debates are remembered because of their importance to the philosophy of science. Niels Bohr had written about these debates in an article titled "Discussions with Einstein on Epistemological Problems in Atomic Physics". Despite their differences of opinion regarding quantum mechanics, Bohr and Einstein had a mutual admiration that was to last the rest of their lives. The best weapon of a dictatorship is secrecy, but the best weapon of a democracy should be the weapon of openness. Read more Niels Bohr Quotes.